^ Heine, Bernd; Heine, Bernd, eds (2000). African Languages: an Introduction. Cambridge University Press. ^ Epstein, Edmund L.; Kole, Robert, eds (1998). The Language of African Literature. Africa World Press. p. ix. ISBN 0-86543-534-0. http://books.google.com/books?id=XkkrDH27jmIC&lpg=PP1&pg=PR9 2011年6月23日閲覧. "Africa is incredibly rich in language—over 3,000 indigenous languages by some counts, and many creoles, pidgins, and lingua francas." ^ African Union Summit 2006 Khartoum, Sudan. SARPN. ^ Jean-Marie Hombert & Gérard Philippson. 2009. "The linguistic importance of language isolates: the African case." In Peter K. Austin, Oliver Bond, Monik Charette, David Nathan & Peter Sells (eds). Proceedings of Conference on Language Documentation and Linguistic Theory 2. London: SOAS. ^ CIA – The World Factbook. 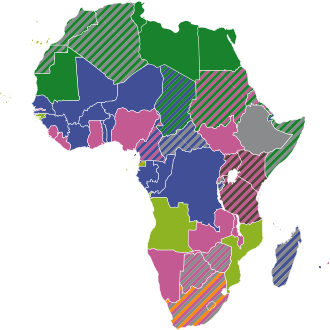 ^ African languages for Africa's development ACALAN (French & English). Childs, G. Tucker (2003). An Introduction to African Languages. Amsterdam: John Benjamin. Chimhundu, Herbert (2002). Language Policies in Africa. (Final report of the Intergovernmental Conference on Language Policies in Africa.) Revised version. UNESCO. Cust, Robert Needham (1883). Modern Languages of Africa. Ellis, Stephen (ed.) (1996). Africa Now: People - Policies - Institutions. The Hague: Ministry of Foreign Affairs (DGIS). Elugbe, Ben (1998) "Cross-border and major languages of Africa." In K. Legère (editor), Cross-border Languages: Reports and Studies, Regional Workshop on Cross-Border Languages, National Institute for Educational Development (NIED), Okahandja, 23–27 September 1996. Windhoek: Gamsberg Macmillan. Greenberg, Joseph H. (1983). 'Some areal characteristics of African languages.' In Ivan R. Dihoff (editor), Current Approaches to African Linguistics, Vol. 1 (Publications in African Languages and Linguistics, Vol. 1), Dordrecht: Foris, 3-21. Greenberg, Joseph H. (1966). The Languages of Africa (2nd edition with additions and corrections). Bloomington: Indiana University. Heine, Bernd and Derek Nurse (editors) (2000). African Languages: An Introduction. Cambridge: Cambridge University Press. Webb, Vic and Kembo-Sure (editors) (1998). African Voices: An Introduction to the Languages and Linguistics of Africa. Cape Town: Oxford University Press Southern Africa. Wedekind, Klaus ( Oxford University Press.